A pesticide made from spider venom has been found to kill insects without harming honeybees. Researchers at Newcastle University combined venom from the Australian funnel-web spider and lectin from snowdrops to create a “bio-pesticide”. Common neonicotinoid pesticides used on crops in Britain are believed to be behind a catastrophic decline in honeybees in recent years. Approximately 90 per cent of the world’s plants rely on pollinating insects to survive, meaning that a decline in bees could have a devastating impact on food production. The new pesticide — Hv1/GNA — will allow bees to forage and pollinate without harm, scientists at Newcastle University’s School of Biology believe. It is thought that neonicotinoids harm honeybee populations by attacking their nerve system, which disrupts learning and memory so that they cannot locate pollen or find their way back to the hive. During the Newcastle study, bees were exposed to varying concentrations of the spider and snowdrop poison over seven days. Researchers found it did not affect the bees’ memory, even in high doses. Dr Geraldine Wright, of the university’s Honeybee Lab said: “If we destroy the biodiversity of pollinators then it will be irrelevant how effective our pesticides are because we won’t have any crops to protect. 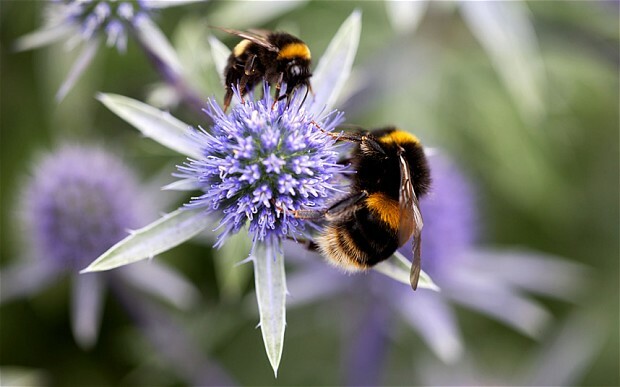 Read the full story via Spider venom pesticide that has no sting for bees – Telegraph.